Productora / Production Company: CAHUENGA FILMMAKER S.L. Cromosoma 5 es una historia de pérdida y encuentro. Andrea pierde parte de su quinto cromosoma, pero su madre encontrará una nueva forma de mirar y de aceptar. 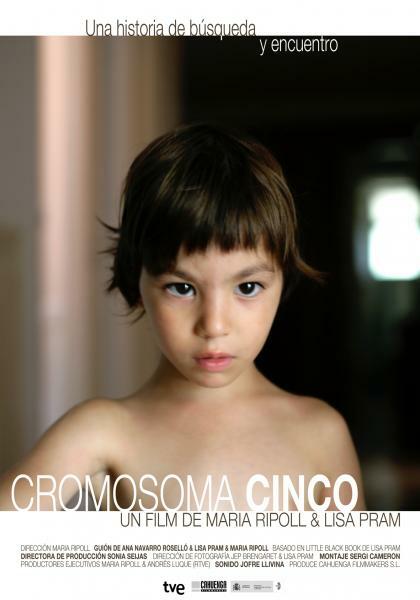 Chromosome 5 is a story of loss and encounter. Andrea loses a small part of her chromosome 5, but her mother has to find a new way of seeing and accepting. MARIA RIPOLL (Barcelona, 23/06/1965) Master en dirección de cine en el American Film Institute (AFI) Ha dirigido varios largometrajes: LLUVIA EN LOS ZAPATOS (1999), TORTILLA SOUP (2001), UTOPIA (2004) y TU VIDA EN 65’(2007) consiguiendo selecciones y premios en festivales tan prestigiosos como el Montreal Film Festival, Festival de Sitges, Seattle Film Festival, Los Angeles Film Festival o los Goya. Directora de spots publicitarios para Monkey Films y Picnic (Barcelona), Milagro Films (Los Angeles) y Vertigo Films (Mexico D.F) Imparte cursos de Análisis de guión y Dirección de actores para Sgae y Central de Cine. En 2013 produce y dirige CROMOSOMA CINCO, documental coproducido por TVE. LISA PRAM (Dinamarca, 14/01/1974) Fotógrafa y Guionista. Su trabajo ha sido expuesto en varias galerías internacionales (más recientemente en el Sakura Gallery de París). También ha expuesto en el NYPHotoFestival, el Voies Off Festival del Rencontres d'Arles y en el Copenhagen Photo Festival. Además ha recibido nominaciones varias veces en el Intl'PhotoAwards, el Margaret Cameron Award y el Photography Masters Cup en la categoría de Fine Art. MARIA RIPOLL (Barcelona, Spain, 06/23/1965) Master in film directing at the American Film Institute (AFI) She has directed several feature films: Rain in his shoes (1999), Tortilla soup (2001), Utopia (2004) and Your life in 65' (2007) All of them have got selections and awards in such prestigious festivals like Montreal Film Festival, Sitges Film Festival, Seattle Film Festival, Los Angeles Film Festival and the Goya Spanish awards. She is director of commercials for Monkey Films and Picnic (Barcelona), Milagro Films (Los Angeles) and Vertigo Films (Mexico DF) She teaches courses in Script Analysis and Directing Actors for Film in Sgae and Central de Cine (Spain). In 2013 she has produced and directed Chromosome 5, documentary co-produced by TVE. LISA PRAM (Denmark, 01/14/1974) Photographer and Writer. Her work has been exhibited in several international galleries (most recently in Paris Gallery Sakura). She has also exhibited in NYPHotoFestival, the Voies Off Festival Rencontres d'Arles and the Copenhagen Photo Festival. Lisa has also received nominations Intl'PhotoAwards several times in the Margaret Cameron Award and Photography Masters Cup in the category of Fine Art.